Making a Murderer lawyers Dean Strang and Jerry Buting have claimed that progressive new DNA testing could be the answer to their prayers in proving Steven Avery’s innocence. 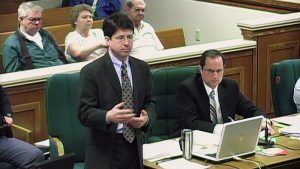 The Making a Murderer documentary featured two lawyers, Dean Strang and Jerry Buting, who represented Steven Avery; the convicted killer whose court case the popular series followed. At the end of the series, Avery was found guilty of murdering Teresa Haibach, but now the two lawyers have unveiled information about new DNA testing that could potentially pave the way for an upcoming new trial. During an appearance on Australian TV show Lateline, the pair explained how these progressive tests could shed new light on blood found at the scene of the crime. Strang went on to describe how the new methods could evidence that the blood found in the victim’s car actually pre-dated the murder. Avery, who has always proclaimed his innocence, now has a new lawyer, Kathleen Zellner. Zellner recently claimed that a “tsunami” of new evidence is on the horizon. She is working on an appeal, and recently filed a motion with the Manitowoc Circuit Court in Wisconsin requesting new testing methods that did not exist at the time of the trial to be used. It is looking as though the next instalment of the Netflix series could be just as gripping as the last. Will Steven Avery ever walk away a free man? Netflix has announced it has ordered more episodes of original documentary hit, Making A Murderer. The first series was universally acclaimed, receiving six Emmy Award nominations including Outstanding Documentary or Non-Fiction Series. It followed the story of Stephen Avery, a man who was wrongly imprisoned for the murder of Penny Beerntsen for eighteen years. After being exonerated in 2003, Stephen Avery was then charged with the murder of photographer Teresa Halbach in 2005. The documentary suggests Avery was innocent of both crimes. The second series will turn back to the Avery case, including an in-depth look at the post-conviction process and exploring the emotional toll this process took on those involved in the Avery case. It will feature interviews with Avery’s new lawyer Kathleen Zellner and Avery’s co-defendant Brendan Dassey’s legal team. Family and characters close to the case will also be involved. Vice President of Original Documentary Programming at Netflix, Lisa Nishimura, said: “Because of Ricciardi’s and Demos’ incredible vision, commitment and keen eye, audiences around the globe became completely captivated by the personal stories of Steven Avery and Brendan Dassey and the unique lens their experiences provide into the criminal justice system.